My son and I were talking the other day about getting things done, and I told him I feel overwhelmed by all I need to do, so I procrastinate. He said "Do something for ten minutes. You can do anything for 10 minutes." ever know how much this one quote changed my life, but I'm doing this partly in honor of him. I've use the 10 minute strategy before. I used it a lot when I need to get my house clean for some event or visitor. I hate housework, and I have to work, so I take 10 minute breaks to clean. I usually start a few days ahead of time so I can get more done, and it really works. I have a bad back, and every time I'd move, I had to pack in 10 minute spurts, then rest my back for 10 minutes, then start again. If it got too painful, I'd pack for five minutes with 10 minutes rest. Somehow, everything always got done. I've mentioned housecleaning, but there are other aspects of my new life plan where the 10 minute strategy will work extremely well for me. I have a short attention span and take meds for ADHD, but still, I can't concentrate on anything for long periods of time. This is why I prefer to write short articles or product descriptions that take only a few minutes apiece. Sometimes it takes me three or four sessions to get a blog post written. Exercise - I need to do at least 30 minutes of exercise a day, but even exercise gurus say if you don't have 30 minutes to devote, then do 10 minutes of intensive exercise. Some think you accomplish more with several shorter sessions of intensive exercise than you do with a normal 30-minute workout (there is a name for this, but I can't remember it) I'm not in good enough shape to even do 10 minutes of intensive exercise right now, so if it comes down to it, I'll do 5 intensive minutes and 5 cool-down minutes and work my way up. Decluttering - I have over 100 boxes to go through, and I can't even decorate until I get rid of at least half of them. I can take 10 minutes a day and go through one box, or maybe even two, dividing the contents into keep, donate, toss and decide later boxes. I'll have to work fast, using the 5-second rule to make each decision, but it will only work if I don't have to stay in that depressing room for over 10 minutes. Gardening - I tend to spend way too much time working very slowly in my garden, and in the heat of summer, I can't stay out there very long. I'm going to set up a simple shade area with a tarp and poles and when I simply cannot sit in this house for one more minute, I'll go out and work for 10 minutes on potting, re-potting, sowing seeds, or whatever else I can do under that tarp. In the early morning, I'll do most of my weeding, trimming, etc. that has to be done out in the garden itself. Affiliate Marketing - Finding an affiliate to promote is a long, tedious process. I intend to spend at least 10 minutes a day just searching Affiliate catalogs, eBay and Amazon for products to promote. Once I find one, I'll spend 10 minutes at a time researching, building a page and writing a review for each one. Making Lists - I can't work without a list. I have to know what I need to do and have a schedule for getting it done. Because of my ADHD structure is the most important thing in my life, and it falls apart without it. Working on my own, I have to create my structure and schedule myself, and lists are a huge part of that. As I think of something, I need to put it down on a list of potential projects, blog posts, etc. and then make a list of how I'm going to accomplish the goal. Ten minutes is plenty of time to do make an individual list. 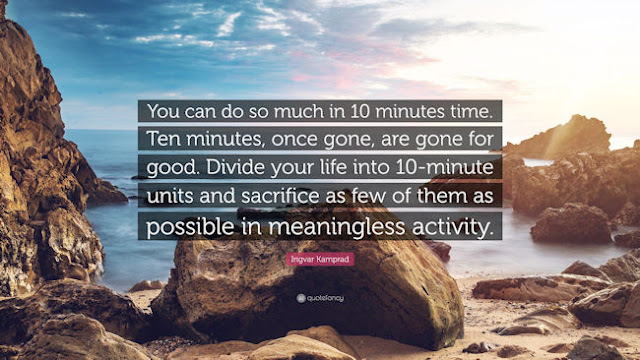 Social Media - Like most people, I can waste hours on social media, but I can't afford to do that, so I'm timing myself to only spend 10 minutes at a time on each one, every day. I could be a spammer and only visit to post links, but I hate those people, so I'll spend time socializing as well -- because I love chatting! I'm also creating a new section of the blog and a new hashtag called "The 10 Minute Life" #the10minutelife. If you follow me on my Facebook page, Twitter, Google+ or Instagram, we can discuss how you use the 10 minutes strategy to get things accomplished in your life.